Despite the cool conditions and threatening skies there was a splendid turnout again this year for the GBU relays with club and guest runners taking part. The start and finish is the junction of Hawkes Mill Lane and Browns Lane. The route is from Hawkes Mill Lane, left at the White Lion pub, along Wall Hill Road, then left to Bridle Brook Lane, on to Washbrook Lane, left into Hawkes Mill Lane, up the hill to the finish at the junction with Browns Lane. Rich Cawley had done a superb job working out the teams, and the results was an exciting close finish for the first few teams to complete all three laps of this interesting course. 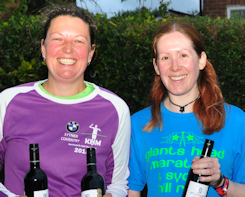 Bottles of wine were presented to the winning team of Helen Hodge, James Lacey and Amy Burdis. 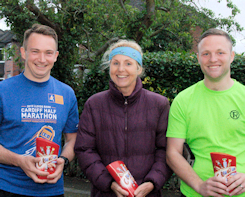 The second team of David Giles, Jane Edwards and Simon Davies and the third placed team of Dominic Price, David Mills and Joe Kelly received chocolates as prizes. 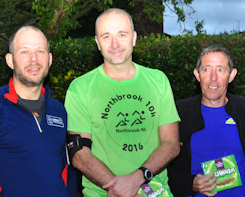 Thanks to Rich for sorting the teams, to Bob and Paul for timekeeping and to everyone who helped on the night. A late start on a very hot Sunday in Hampton in Arden saw 12 Northbrookers brave the furnace like heat that the Arden 9 threw at us. Headwear, suncream, sunglasses, vests and shorts and loads of water was the order of the day. I have never seen so many runners run from shade to shade to looking for the coolest line to run. Extra water stations had been set up and numerous householders came out with their garden hoses to stop us overheating. It was too hot for me to race, so getting to the finish was the goal for me, a nice steady run that was comfortable despite the heat. 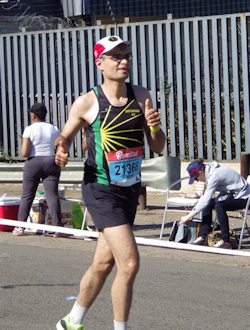 Ever since I first landed in South Africa (in 2013) and announced that I was ‘a runner’ I’ve had people there asking if I’d completed the Comrades Marathon. 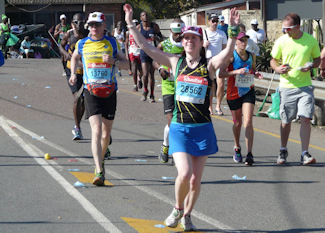 Apparently everyone needs to do the Comrades at least once to be a ‘proper’ runner! 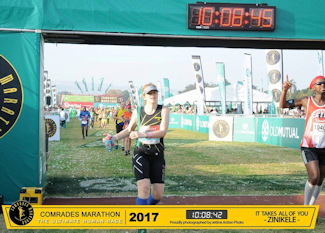 And so it was, that after successfully putting it off for a few years, I finally caved in last year and entered the Comrades. As an added bonus, it fitted in really nicely with our wedding plans in South Africa. You might even say we planned it that way. This year was an “Up” run, starting at sea level in Durban, and ending at 600m altitude in Pietermaritzburg 87km later. You’d think one Northbrooker being crazy enough to attempt this is bad enough, but we actually managed to get three to come along; Amy Burdis came along for the wedding too as did Clare Rowntree who was sensible enough though not to run further than 5km at a time. For Amy, these days 87km is almost a sprint, but perhaps more impressively, Liz Pharoah, who was looking to do something special to celebrate an important birthday – 21st I think? – came over just for the week to do the run. The race started at a sleep-depriving 5:30am which, being dark and in winter was a bit chilly. Fortunately, all of us had experience of early starts and cold weather thanks to “altitude training” at Nambiti Nature Reserve – none of us were caught by lions anyway. The early start helped us to get away from the worst of the humidity by the coast before the sun came up and it got too hot. We were impressed by the incredible number of supporters and the atmosphere they brought, regardless of whether we were in Durban before sunrise, or out in any of the suburbs or villages, or in fact anywhere accessible from the main road. Given that this was an “Up” run, there were a few hills. Thankfully they did at least warn us about the bigger ones (those that last a few km or more) Cowies, Fields and otha’s Hill came and went and I felt reasonably good, passing halfway at about 3:35. I even thought that I might somehow squeak a Silver medal for completing the race in under 7:30. Then came Inchanga, a 6km long beast of a climb that just snakes away into the distance. My legs were really feeling it at this point and as I turned a corner halfway up I found myself having to walk for the first time. Naturally, this was the point at which I came across Bruce Fordyce, 9 times Comrades winner who was one of those most fervent in encouraging me to sign up for this madness. If I recall, he informed everyone within earshot that I was a Leicester City supporter. This not being Coventry, I don’t think anyone minded too much. I managed to jog again at least until I was out of his sight. The Inchanga hill soon made me realise that 7:30 wasn’t going to happen, and every slight incline after that point really started to tell on my legs. I got a couple of leg massages at points along the road to try and soothe calves and hamstrings that ached with every bit of uphill. The support from everyone (special shout-out to wife Lindie, parents, Damian Pharoah and some others you’ve never met) for carrying me through this stage, which culminated in a 2.7km walk (I ran for about 10 steps) up the final big hill, Polly Shortts. Looking back at the stats, Amy (despite finishing an hour back) actually made up a few inutes on me through this stage of the course. So bad did I look here that Lindie actually ran backwards along the course because my tracker seemed to have stopped moving. She then started jogging alongside me and had to slow down so that I could keep up. Fortunately the course after Polly Shortts was basically downhill, which I found much more agreeable and so got to experience the sensation of overtaking people again, all the way through to the finish. At the finish, I was greeted with possibly the smallest finishers’ medal (called a “Bill Rowan”) you’ve ever seen (size isn’t everything). Added to that was the fact that the only route to the International tent was up some steps which take you across the course, which was ever so slightly cruel in my opinion. But the food, drink and chance to meet up with my lift home just about made it worthwhile.